Global risk sentiment downshifted into risk-off mode thanks to weak economic data all over the place, placing the Japanese yen as one of the top performers for the week. As expected, Japan’s basket of low tier economic reports did not appear to have been factors to the directional movement or volatility in yen pairs this week. Once again, global risk sentiment and counter currency drivers were the likely drivers for price action among the yen pairs. Global risk sentiment started on a positive footing at the beginning of the week, and since no new catalyst could seem to be correlated with the risk-on lean, it’s likely the sentiment was an extension of the risk-on rally sparked by positive U.S. data last Friday. 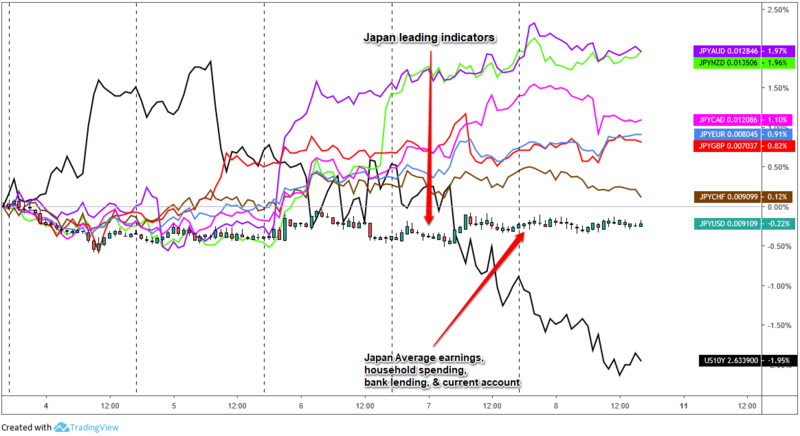 This is likely the reason why we saw the Japanese yen underperform against most the of the major currencies through Monday and Tuesday, with exception to the British pound that has been feeling pressured due to Brexit developments. The shift to global risk-off sentiment began on Wednesday during the morning London session, and seems to correlate with the much weaker-than-expected German factory orders, another signal of likely recession coming for Europe. It’s also around the same time we saw more rhetoric from EU officials in their reluctance to re-open negotiations on the Brexit deal, adding to a rising probability of a “no deal” Brexit scenario–a potentially disastrous for both the European Union and the United Kingdom. Economic data releases from Europe were actually weak all week, and combined with weak economic events from around the globe (e.g., falling U.S. service sector business sentiment, weak U.K. housing data, dovish rhetoric from the Reserve Bank of Australia and the Bank of England), it’s likely the growing picture of a global growth slowdown was the main driver for risk-off sentiment into Friday’s trade. And an argument can be made for additional pressure coming from reports that the U.S. and China were far from a trade deal, according to White House economic advisor Larry Kudlow. On Friday, risk-on sentiment did bounce back a bit and was likely the reason the yen pulled back from its highs going into the weekend. It doesn’t look like there was one big catalyst for the shift, but the turn seems to correlated with positive economic report releases including a report of widening trade surplus from Germany, better-than-expected French industrial production in December, and maybe even the much better-than-expected Canadian jobs data. Despite the end-0f-week pullback, the Japanese yen beat out most of the major currencies to easily place as the second best performing major currency of the week.